We give you our best espresso shot - coffee laced dark chocolate cake paired beautifully with a thick layer of chocolate espresso ganache. Coffee never looked so good! Storage Conditions: Please keep the cake refrigerated. 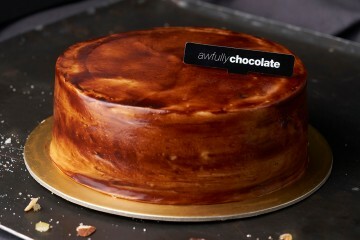 This is the cake that started it all - the signature All Chocolate Cake. 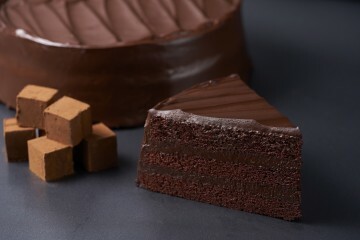 An everyday chocolate cake made with our own chocolate, with its unique dark roast flavour. 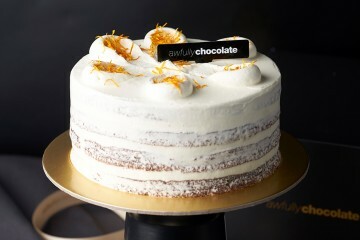 This cake does not contain any cream, and its soft and moist cake layers are not too sweet, allowing the natural roast of the cocoa to shine through. The true blue foodie knows the magic of fresh local banana! We only use local bananas like pisang mas or pisang rajah, bought from small farms, for our delicious Chocolate Banana Cake, which has two layers of fresh banana between layers of chocolate cake. We use only whole dark pitted cherries and soak them in rum to bring out their flavour. 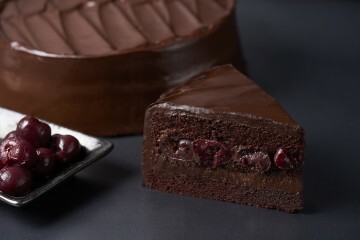 The cherries cover both layers of fudge, and cherry rum juice is also drizzled on the soft cake layers, enhancing the delicious combination of chocolate, rum & cherries. 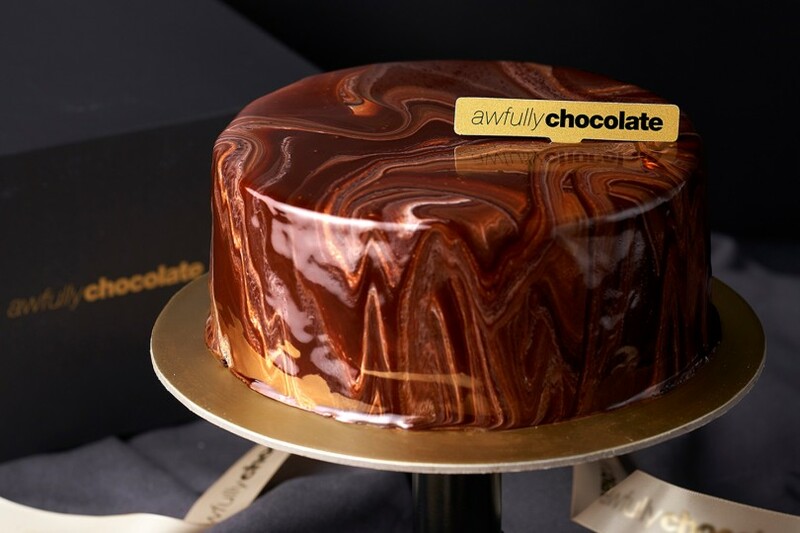 This simply elegant cake has dark chocolate cake layered with a confection of hazelnut praline and lightly crunchy feuilletine. 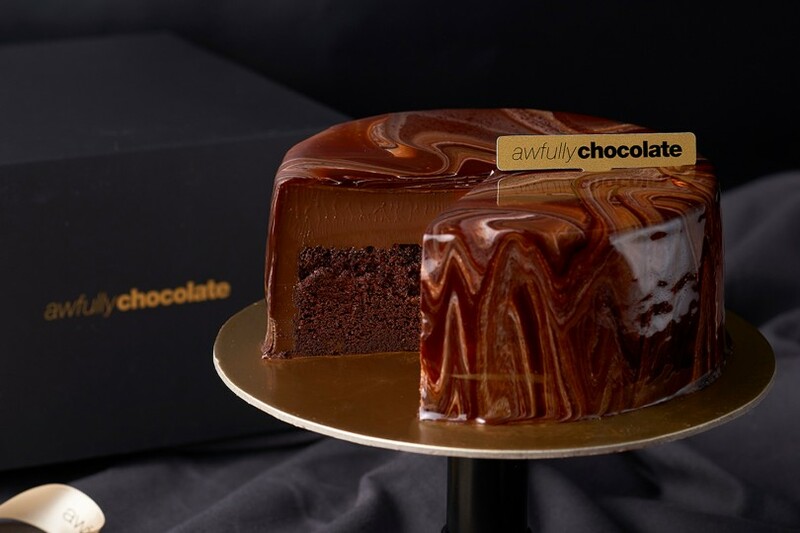 Original French pralines were a pastry filling made of nuts cooked in burnt sugar – enjoy how Awfully Chocolate elevates the praline into a chocolate cake of its own! Butter me up with this decadent two-in-one treat of chocolate and peanut butter! 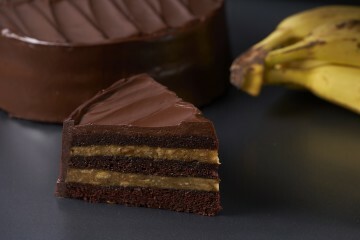 Creamy smooth peanut butter is layered between moist dark chocolate cake and morsels of caramel crunch. A gluten-free choice, this moist chocolate black rice cake with a beautifully light roasted rice fragrance deliciously balances the 60% dark chocolate. Delicately less sweet, an alluring choice with unique Asian notes. Lift your caramel with the natural high of sea salt, combined gorgeously with 60% dark chocolate ganache and layers of soft chocolate cake. 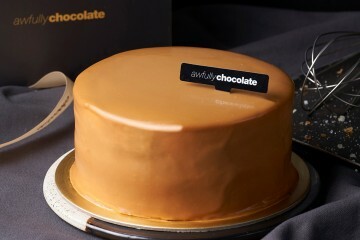 The morsels of caramel brittle and rich salted caramel will take you to sophistication heaven! An elegant Awfully Chocolate rendition of the classical Italian dessert. Must-have mascarpone cheese and Italian sponge fingers are first soaked in coffee and coffee liqueur Kahlua. Then we add the magic of dark chocolate cake drizzled with coffee, and a hearty layer of chocolate sabayon. Inspired by the traditional Southeast Asian Lapis Cake, our best-seller is a richer and denser version of our signature All Chocolate Cake. Each cake layer is baked one at a time, so a completed Super Stacked cake with six layers of cake and six layers of fudge takes almost four hours to complete.